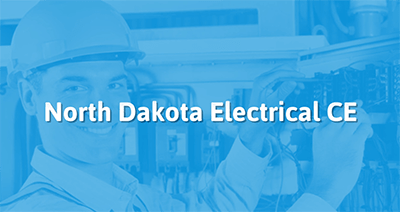 Our North Dakota electrician continuing education courses are approved by the state to satisfy your continuing education requirements. Take the continuing education to renew your ND electricians license today. All of our courses can be completed At Your Pace Online to help you meet the state's requirements to maintain your license. Once you finish your class you will have an official certificate of completion to save for your records, and we will report your course completion to the state for you. All licensed Master, Journeyman, and Class B electricians are required to take 8 hours of continuing education every year. A minimum of fifty percent of the hours shall be based on the 2017 NEC. Journeyman Electrician are due March 31st of every year. Class B and Master Electrician are due April 30th of every year. The same course cannot be repeated in a code cycle for credit.